It was nice that upon visiting with Chris Doyle there was an occasion to celebrate. Perusing Facebook before I walked around the corner to my neighbor's studio for a drawing session this past spring, I saw that Doyle had just announced he had won a Guggenheim for video and film. Doyle moved to Williamsburg in the mid-90's and explained that even then his artist friends had told him he had missed the boat on his move. I know this conversation is like beating a dead horse, but it really fascinates me to learn of the different migratory patterns of artists. Doyle even has an Atlantic flyway to a Maine studio and home for the summer months. His Brooklyn workspace sits mid level between his bedroom and living area and is gently lit by a large wall of glass blocks at the back. The high ceilings let in a maximum amount of midday sunlight for working. The glow of shapes and lines from this keen architectural detail was both confusing and enticing to draw, and so we began our Spring afternoon session. Doyle and I have one major thing in common, so we started our conversation on the topic of drawing. We discussed how drawing is perceived and what kind of audience it invokes — whether it is considered a viable medium or only thought of as a precursor to other processes. Doyle explained to me that through the years he has found multiple ways of approaching drawing in order to vary its degrees of impact. Making very large pieces being one approach, he pointed out a massive and beautifully detailed framed work that hangs in his studio and is a portrait of what was his daily life in his previous living space on Kent Ave. For several years now, his practice has focused on the moving image. Chris has been using layers of delineated marks to expand his drawing through movement by compounding subtle narratives along with rich colors, hidden shapes and slick textures. 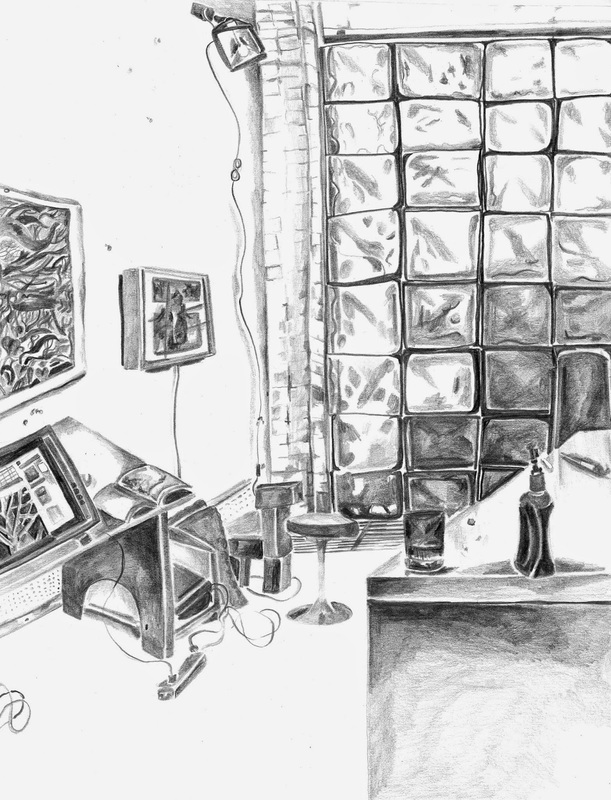 His unimaginably precise and deft renderings, made from a laborious sort of love, translate so clearly to this format — the digital drawing tool he was using while I was there seeming remarkably close to actual pencil and paper. And so he has found where his drawings can live and live vibrantly. And soon they will be living in Times Square. One of Doyle's films, titled Bright Canyon, will premiere on Tuesday, July 1. It will play every night throughout the month from 11:57 p.m. to midnight on Times Square’s 15 electronic billboards, thus taking over that whole massive intense space with a drawn image. Working from photographs and drawings he has made of the Palisades, he has created a video that acts as an homage to what existed, both in animal and plant form, long before the city was ablaze with lights and the energies of 8 million people. The video begins at the treetops and ends in the river, mirroring the verticality of the tall buildings and swiftly moving streams of cars below in the city. The Palisades, just ten miles north of Times Square and immediately west of the Hudson, take an unconstricted breath like we are unable to as city dwellers. I anticipate the collision of the two worlds minutes before a new day begins to be something to stay up for. A Bad at Sports broadcast was playing as we worked — interestingly discussing “interdisciplinary art”— what it means, why it matters, and how it is taught. Doyle and I talked about how both of our practices might be seen as such. As the evening approached, we waited on our respective partners to meet up with us for a very celebratory dinner at a nearby spot we all frequent. The night came fast and late amidst our many toasts and art-related conversations. A splendid way to finish an enriching day. To see more of Doyle's work go here http://chrisdoylestudio.com/ Doyle will also have a solo show opening this September at Catharine Clark Fine Art in San Francisco.